Take a trip back in time to the carefree holidays of your childhood, in the heart of the Dorset countryside. Funny how trends work, isn’t it? History hasn’t been kind to camping of the 1970s. The very phrase conjures up images of leaky single-sheet orange tents, holiday camps a la Hi-de-Hi ­and, of course, Spam. Camping gear has come a long way, with all sorts of state-of–the-art tents to keep the elements at bay. But for all their impressive functionality, there's something... well... a little boring about today's futuristic canvas fortresses. Sure they keep your feet warm, but they don't warm the heart like the fabulously flamboyant decor of a vintage campervan. The old school is now the ultimate in camping kitsch. And for one couple for whom the 70s never went out of style, nothing typifies this spirit of the age better than the Dandy camper. For Paul and Becca Clifford, the humble Dandy camper is the ultimate in British innovation – a masterclass in design that shows it isn't just the Scandinavians who can do ergonomics. When the first Dandy rolled out of Harold Murray's Wigan factory in the early 1960s, campers the world over had an economical, practical, easy-to-tow hybrid of tent and van. And now half a century later, Paul and Becca are sharing this icon of the great British holiday with a whole new generation at Delightful Dandys of Dorset. Taking some masterfully reconditioned vintage campers to a series of unspoiled surroundings across rural Dorset, Paul and Becca have hit on a winning formula. The concept is simple: pick your Dandy; pick your location; the rest is taken care of. As Paul says, "our authentic all-British retro glamping experience lets guests reconnect with the carefree holidays of childhood". It's a genuine ‘turn up and chill out’ experience – no towing, no setting up. Just rock up, kick off your shoes and enjoy the 70s ambience". These titular trailer tents are the real deal – Hornsea crockery, Sanko Ware kettles, and festive bunting abound. But it doesn't take a retromaniac to see the appeal. There's a charming ingenuity and homeliness about the Dandys – like transporting your nan's sitting room to the great outdoors. And with a sturdy locking door, glass windows and an insulated roof that keeps them cooler on warm days, and cosy when the sun goes down, there's more than enough substance to back up the style. Paul and Becca's 'girls' come in a range of sizes to suit everyone. Kitty and Korky (3 berth) are perfect from couples looking for an intimate rural retreat, while Betty and Bella (6 berth) will comfortably sleep a family of four on two double beds, with an additional couple seen to on another double ingeniously concealed within the banquet-style dining table. All come equipped with double gas ring stoves, the larger models feature sinks with running water, and memory foam matresses come as standard. But it's the little touches and reassuring creature comforts that really make a stay in one of the Dandys so delightful – luxury bedding (gingham cotton sleeping bags for the kids); a host of complimentary games; and a welcome basket of local goodies. Dorset is blessed with a wealth of spectacular settings for a camping holiday, and Paul and Becca have expertly selected some of the county's most unique Cool Camping-approved campsites to hosts their foldable abodes. Settings like the perennialy popular Eweleaze Farm. Perched atop a cliff in Osmington, this vast organic-farm site boasts glorious panoramic vistas over Weymouth Bay. You can't take a bad photo of this place. We've tried. Then there's Longthorns Farm, a charming alpaca smallholding just outside Wareham. Your ears don't deceive you, the peculiar sounds you hear emanating from the next door neighbour's are the cheeky simian residents of Monkey World, one of Dorset's top attractions. Paul's newest host is Farrs Meadow, a stunningly-located hillside hideaway just outside the pretty market town of Wimborne. With far-reaching views across the Stour Valley, an organic farmshop onsite, and tranquil river for a spot of wild swimming, this place couldn't be more idyllic. All are well placed for exploring the south-west's numerous natural wonders like Durdle Door, the Jurassic Coast, and Lulworth Cove via the South West Coast Path. But if you don't find the location to suit, it's possible to arrange for a Delightful Dandy to be located at a Dorset campsite of your choice. A handy Dandy indeed. And if you needed anymore convincing that Dandys are cool (our word isn't enough, huh?! ), you can soon catch the Delightful Dandy's at some of the UK's hottest summer festivals – watch this space. What's more, you can now book the Dandy Disco for your own private rave. 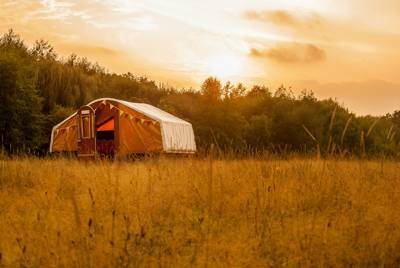 While the vibe might be 70s, the dazzling lighting and digital sound system are strictly hi-tech and sure to transform your glamping gathering into a boogie wonderland. Delighful Dandys of Dorset are avilable to hire from 1st May - 28th September. Prices start from £185 for a 2-night stay. See www.delightfuldandys.co.uk or contact Paul (01258 451308) paul@delightfuldandys.co.uk for more information.